Silver Mountain Resort, celebrating 50 years of operation this season, is conveniently located off of Interstate 90 in Kellogg, Idaho. Upon arrival, skiers and snowboarders will find easy parking and a fully equipped village with lodging, an indoor waterpark — Silver Rapids, Idaho's largest — and plenty of eateries and watering holes. The adventure begins with an easy gondola ride, taking you to the mountaintop village. On the mountain, there are 1,600 acres to explore, with a vertical drop of 2,200 feet and an annual average snowfall of 340 inches. For those seeking out adventure, a trip to the top of Wardner Peak is a must, with steeps, glades, and big, wide-open powder fields. The ground crews at Silver Mountain Resort have been busy this summer, with many ski-area improvements. "Klondike Express is a new intermediate run in the Chair 2 Basin that allows for nonstop, top-to-bottom laps and easy access to the terrain park," says Willy Bartlett, the resort's marketing coordinator. 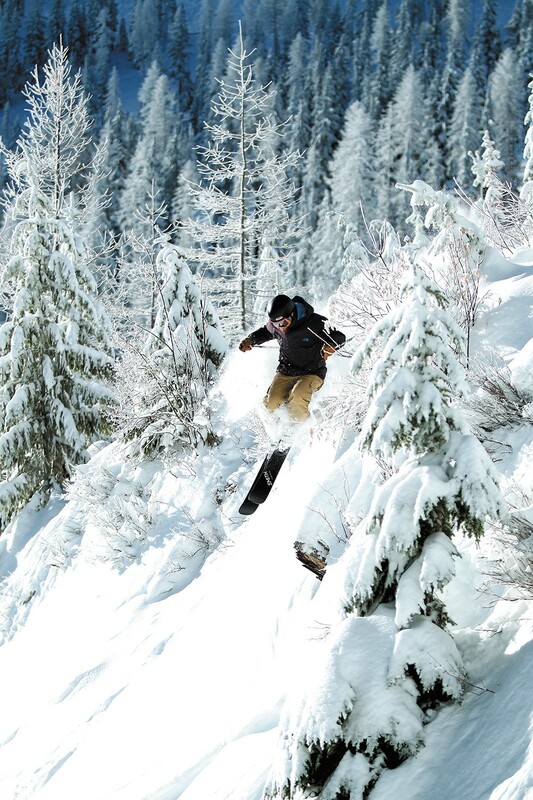 The work didn't stop there; he explains that the crew has been working on opening up the mountain's North Face Glades area: "This zone already features some of the best tree riding in the Northwest, and it is getting even better for the 2017-18 season." There also have been brush-cutting efforts, and the snow-tubing lanes have been lengthened. Off-mountain improvements can be seen online, with the installation of a new HD webcam at the top of Kellogg Peak, in conjunction with KREM-TV, providing a real-time look at what the conditions are really like. "Our Snow Stake webcam and both Mountain Haus webcams have been updated to HD quality for this season," says Bartlett. "We will have all-HD webcams on the mountain now; guests will also be able to view a live feed of the mountain, via our new screen mounted in the village." As for amenities, there will be many new options in the Gondola Village, including a grab-and-go option with the addition of a beverage and snack shack right next to the gondola line, allowing you to get a beverage or snack for the ride up. The Jackass Snack Shack will reopen for the first time in years, providing food and beverage options in the Chair 4 Basin. Look for the "open" sign during the season's busiest times. The best deals at Silver Mountain are found through its many Lodging Packages, whether you want to ski, snow-tube or just want a family getaway to enjoy the Silver Rapids indoor waterpark, where the water is always 84 degrees. Check out the website (silvermt.com) for the package that best suits your needs; there are plenty of options to chose from. Silver's affordable season pass deadline is also nearing, with Youth passes on sale for $289, Adult passes for $399. Buy soon, as the deadline is Nov. 5.